Chemistry at IU Northwest – Where Should I Start? Figuring out the right chemistry class at the outset can be tough; you might not have taken a chemistry class before, it may have been several years since your last chemistry class, or you may have even passed high school or AP chemistry but didn’t feel like you really got enough of the material to go to the next level. 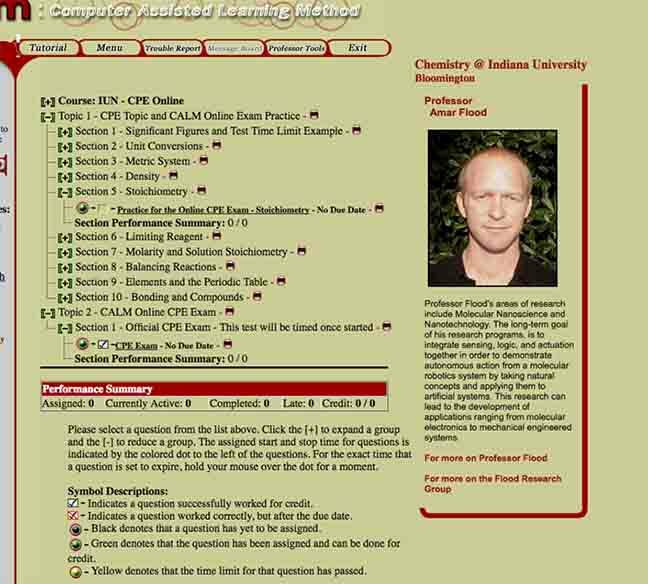 There are two initial chemistry classes at IUN, C101 (Elementary Chemistry) and C105 (Principles of Chemistry). The C105 class is a required course for many science majors at IUN, so students sometimes jump straight to C105 before they’re ready for the material. While C101 is a class that stands on its own, it is a great skill-building experience that has shown success in preparing students for C105. Choosing the appropriate class for a student has proven a tough enough issue that IU Northwest has a Chemistry Placement Exam, CPE for short, to help students figure out where they should begin without getting in over their head. It is a timed (1 hour 15 minutes), 30 question online test that tests your knowledge of high school chemistry topics (the same exam is used at IU-Bloomington). Years of data have shown that students don’t reliably pass C105 when they score a 7/30 or below on this exam at the beginning of the year. Additionally, students who have completed C101 both score higher on the placement exam AND have higher pass rates in C105. The initial webpage for the CPE has two initial links, a link for registration and a link for signing in. Click on the registration link and input some basic information to get registered into the system. Afterwards, click on the sign-in link, and sign into the sight using your IU username and password. After signing in, you should see a page similar to the one pictured below. In particular, note that there are two sections, labeled Topic 1 and Topic 2. The first group of items are refresher material while the second is the actual placement exam. The subjects here denote the material that will be tested in the actual placement exam. These can serve as nice reminder problems, so that you don’t feel rusty while taking the actual placement exam. There is no credit for completing these exercises, they are completely optional. This is the actual placement test you will need to complete in order to determine the best level of chemistry to start with. It has a 1 hour and 15 minute timer, and cannot be paused; make sure you have enough time to complete the test before you begin. You should bring a scientific or graphing calculator with you, however there will be a link to a periodic table at the top of the question pages during the exam. After the exam is complete, your score should be displayed. If you scored an 8 or higher: You appear to be ready for the C105 (Principles of Chemistry I) class. The administrative block on registration will be removed shortly after taking the exam or the following morning if the exam was taken in the late afternoon. You will then be able to sign up for the course. Please contact kellydn@iun.edu if you have a question. If some of the questions stumped you or didn’t seem familiar, it is recommended that you do a little pre-studying to get fresh with the material – passing the exam is not a guarantee that you will pass the course. If you score a 7 or lower: It seems like you need some more preparation before entering C105. There are two main options available to you, described below. - Enroll in C101 next semester. C101 is a solid way of building up your chemistry and algebra skills to be ready for C105. A grade of C- or higher in C101 will allow you to skip the placement exam requirement. - Enroll in the IUN ALEKS Chem-Prep Course. This option is an online course is designed to be a “boot-camp” of chemistry skill-building. The ALEKS system is designed to figure out the skills you need work on, provide you with information and homework problems to build mastery, and then re-assess to move you onto more and more advanced topics. This is an intensive option (~25-40 hours of work), and is not effective if activities are done sporadically. Casually doing the activities can result in never building up mastery of the material, and making it difficult to complete the course. Information for signing up can be found in the following pdf file ALEKS-GUIDE. For additional information or questions please send an email message to Professor Dan Kelly.